Healthy tooth enamel yellows over time. Teeth whitening in Las Cruces lifts stains from deep within your tooth structure, producing a dazzling smile quickly and comfortably. 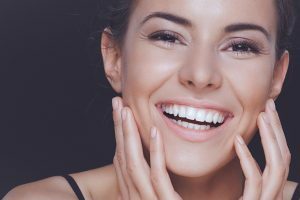 Look years younger in time for summer with a cosmetic dentistry consultation at Painted Skies Dental Center where Drs. Ramon and Natalie Ortiz really love bringing out the best in your oral health and smile aesthetics. Your dentist in Las Cruces achieves predictably dramatic results with in-office Zoom! Whitening. The doctor will assist you in selecting the method which will work best for your smile and your lifestyle. In-office Zoom! employs concentrated hydrogen peroxide gel to lift staining organic material out of the tooth enamel matrix. The tooth and gum sensitivity common to over the counter whitening strips and trays is not a problem. The at-home whitening option employs carbamide peroxide for use over two weeks of gradual color improvement. Chewing tobacco or smoking cigarettes create both yellow and brown stains on teeth, too. Some antibiotics and antihistamines, oral trauma, and root canal treatment discolor teeth. Older teens and adults with healthy teeth and gums make excellent whitening candidates, especially if they are diligent about brushing and flossing. Pregnant and lactating women should postpone whitening and other elective dental procedures until a later date. Zoom! Whitening takes just about an hour. The patient just relaxes in the dental chair. The tongue, lips, and gums are protected with a thin rubber dam before application of the bleaching gel. The gel is swabbed on tooth surfaces, and the dentist allows it to penetrate, rinsing it off after 15 minutes. Two more applications complete the process. Zoom! Whitening leaves a smile up to 10 shades brighter. An LED light accelerates the active ingredient in the gel. At-home whitening, applied with custom-fitted whitening trays, work well, too. The treatment uses a carbamide peroxide gel. Patients wear the filled trays for a prescribed time for about two weeks to produce noticeably brighter enamel. Have your smile be as bright as the summer sun. Take advantage of Zoom! Whitening and other aesthetic services by contacting Painted Skies Dental Center today.